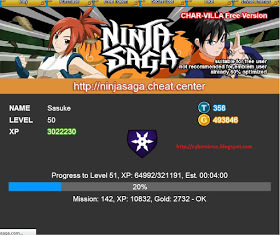 Ninja Saga Cheat ATM Exp and ATM Gold 2014, by using this Cheat you will be very easy to get the experience to raise your level and to obtain much gold are automatically. You can download Ninja Saga ATM Exp and ATM Gold 2014 for free, no pass and survey. This Cheat only work for free user not emblem user. ATM Gold : Useful to increase the gold. * Open Fiddler then Log in to your facebook acoount, back to fiddler and tick "Enable automatic responses" and "Unmatched requests passthrough"
* Drag and drop SWF File in to the "Add rule editor"